Montoursville picked up its first win of the season, defeating Williamsport, 5-0, in high school girls tennis on Wednesday. Maddy Reeves defeated Katie Meale in three sets, 6-1, 4-6, 6-2, at first singles. Karina Dangle also won in three sets at No. 3 singles, 6-7 (4), 6-3, 6-3. Milton remained undefeated with a 4-1 win over Lewisburg. Laura Shaarreai got Lewisburg on the board with a 6-0, 6-0 win over Haley Seabold at No. 1 singles. Hughesville continued its undefeated start to the season, beating Muncy, 5-0. Jade Cordrey defeated Alena Porter in a three-set battle 6-4, 4-6, 7-5 at No. 2 singles. Lily Summerson, Lauren Peck and Sarah Bastian won their singles matches while Jenny Bowman and Zoe Jackson won No. 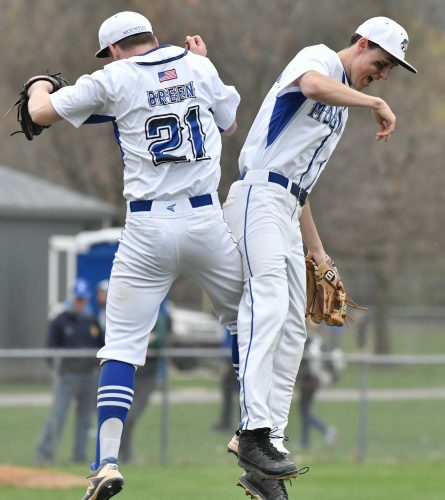 1 doubles as South Williamsport defeated Shikellamy, 5-0. Loyalsock set up a match of unbeatens by beating Montgomery, 5-0, to move to 3-0. The Lancers face unbeaten Milton on Monday. Melina Vuocolo and Morgan O’Connor combined for a 6-0, 6-0 win at No. 2 doubles for Loyalsock. • Central Mountain’s Tyler Adair tied for medalist honors on his home course with a 5-over par 78 in high school golf. Matt Storeman added a 79 for the Wildcats, and Montgomery’s Mike Miller shot an 83. Laura Shaareai, L, def. Haley Seebold, 6-0, 6-0; Rachel Boop, M, def. C. Sigil, 6-4, 6-4; Olivia Eisenhauer, M, def. Lexi Markunas, 7-5, 6-2. Chloe Perrin/Emily Snyder, M, def. Maria Coope/Erin Hilkert, 6-2, 6-2; Mekayla Schrock/Hanna Seebold, M, def. Hallie Keiser/Hannah Castellan, 6-0, 6-1. Records: Milton (3-0), Lewisburg (1-2). Next Matches: Milton at Loyalsock, Monday, 4 p.m., Hughesville at Lewisburg, Saturday, 3 p.m.
Rachel Thomas, H, def. Isabella Rymsza, 6-2, 6-1; Jade Cordrey, H, def. Alena Porter, 6-4, 4-6, 7-5; Kendra Smith, H, def. Faith Milhalick, 6-2, 6-0. Lauren Hall/Carlee Pepper, H, def. Kryshia Reis/Lexie Jacquez-Armenta; Emily Watts/Riley Emerick, H, def. Lauryn Laidacker/Gianna Edkin. Records: Hughesville (2-0), Muncy (1-1). Next Matches: Hughesville at Lewisburg, Saturday, 3 p.m., Muncy at Montoursville, Tuesday, 4 p.m.
Lily Summerson, SW, def. Delanie Wolever, 6-3, 6-0; Lauren Peck, SW, def. Ashley Strevig, 6-0, 6-0; Sarah Bastian, SW, def. Heather Beveridge, 6-0, 6-2. Jenny Bowman/Zoe Jackson, SW, def. Megan Moyer/Alexus Newman, 6-0, 6-0; Alayna McGovern/Ella Livorno, SW, def. Marillen Castle/Kelly Sprenkel, 6-1, 6-2. Record: South Williasmport (1-1). Next Match: Montoursville at South Williasmport, Monday, 4 p.m.
Maddy Reeves, M, def. Katie Meale, 6-1, 4-6, 6-2; Olivia Evans, M, def. Mia Shuler, 5-7, 6-1, 6-4; Karina Dangle, M, def. Kalindi Maggs, 6-7 (4), 6-3, 6-3. Madison Clary/Lydia Barbour, M, def. Taylor Shipman/Megan Wike, 6-4, 7-6 (2); Alena Clary/Tori Kleese, M, def. Desiree Aversa/Madison Marchese, 6-3, 6-3. 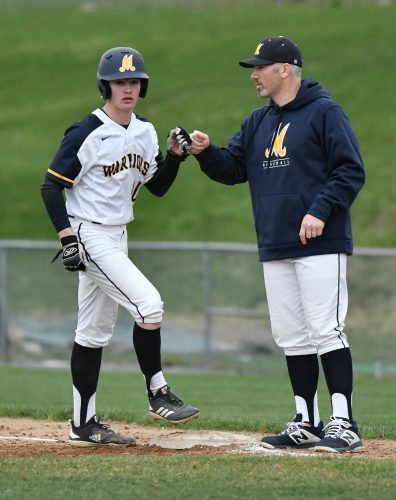 Records: Montoursville (1-0), Williamsport (2-1). Next Match: Montoursville at South Williamsport, Monday, 4 p.m., Central Mountain at Williamsport, Monday, 4 p.m.
Katie Savidge, L, def. Katie Forrestal, 6-2, 6-1; Madison Savidge, L, def. Abby Stryker, 6-2, 6-2; Jenna Beiter, L, def. Racheal Miller, 6-3, 6-1. Records: Loyalsock (3-0); Montgomery (0-1). Next: Milton at Loyalsock, Monday. Central Mountain: Matt Storeman, 79; Tyler Adair, 78; Jason Floruss, 90; Logan Fisher, 86; Chase Confer, 91; Zach Somers, 96. Benton: Daryn Hess, 78; Mike Sherrick, 86; Will Holdren, 92; Mike Mrythel, 91; Jake Fought, 108; Jeff Keloski, 101. Montgomery: Mike Miller, 83; Mario Barberio, 101; Brandon Daldo, 104; Austin Diehl, 128. Sullivan County: John Saxe, 107; Alex Baumonk, 105; Nate Hansen, 120; Alexis Randall, 117; Will Kiner, 118; Braeden Bedford, 138. Sugar Valley: Garrett Walizer, 108; Brandon Flick, 111; Logan White, 117; Isaac Shawver, 139; Skyler Nixon, 150; Blaire Falk, 167.